Summer is underway and it's high time for picnics, grilling, and backyard parties! After sweltering in the sun all day, why not invite some friends over to share food and drinks while enjoying the cooler evening temperatures? 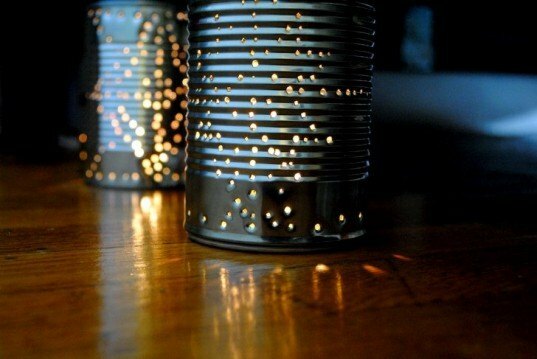 If you are entertaining this summer, you can welcome your guests with homemade punched-tin patio lanterns created from recycled cans. 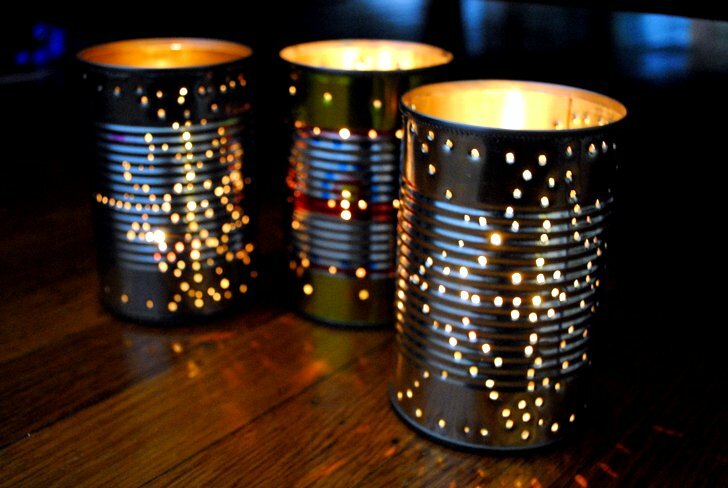 The materials are practically free, and the tiny holes create gorgeous scattered light patterns on your table when you drop a votive candle inside. Make your own lanterns by following our 7 simple steps ahead! 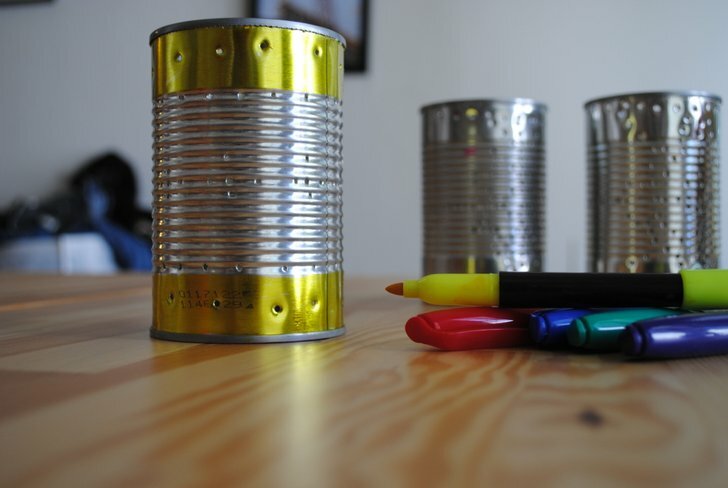 With your newly gathered used tin cans, remove labels, and clean thoroughly. Fill each can with water and freeze overnight until solid. The ice stabilizes the can and prevents it from bending when you punch holes in them later. Decide on a design for your punched-tin decorations. 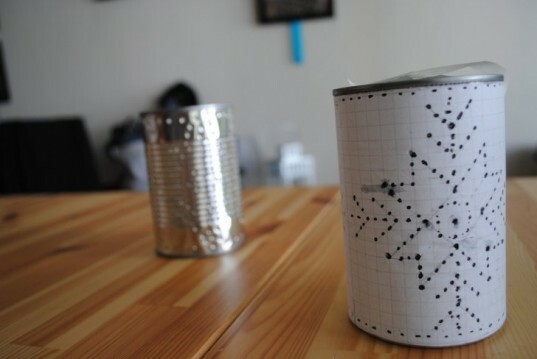 You can draw the pattern out ahead of time on a piece of graph paper and tape it to the can as a guide. Alternatively, you can freehand a design without marking it ahead of time. Knitting patterns, wallpaper, textiles, and folk art are all great inspiration sources for patterns! 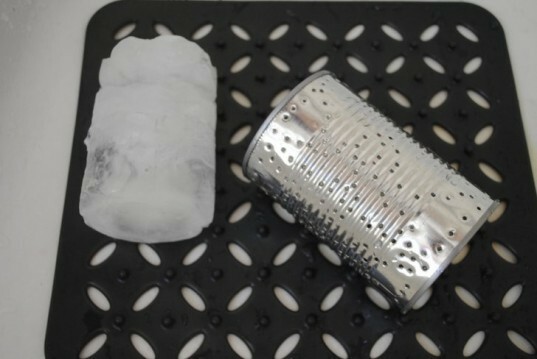 Cradle the frozen tin can in a folded towel (to prevent the can from moving and to catch ice chips). Position a sharp, narrow nail above each mark on your pattern and gently tap it 3-4 times with the hammer until just the point has punched the tin can. Repeat for each mark until you have completed your pattern. Rinse the can under a hot tap until the ice block pops out and allow the can to dry. If you want to add color to your new punched-tin lantern, you can create a variety of fun, shiny designs by simply using colorful permanent markers. STEP 7: LIGHT ‘EM UP! Drop in some lighted votive candles and enjoy the fun, flickering patterns cast by your new handmade lanterns! Be sure to place the lanterns on a fire-safe surface as the candles can get hot. I have made these to use as luminaries during the Winter Solstice. Thanks for reminding me of the technique to use for summer lighting too. I'm making these to hang for my wedding. To prevent bulges at the bottom, put a bit of water (half an inch or so) in the cans and freeze. Then fill it the rest of the way and refreeze. The bit you put in first will freeze without bulging out the bottom and keep the rest from pushing against it later. Maybe a more environmental idea would be to sit the finished buckets in a bucket and collect the water from the ice melting and water your plants with that-rather than use more water-and heating it-to get rid of the ice?? I have lived on tank water for 32 years, so collect every spare drop! Is there any advice for the jagged edges inside the can after the holes are made? I haven't tried this, but to avoid the bottom of the can bulging, you could put a ball of aluminum foil at the bottom and add water on top. The foil should compress as the water expands upon freezing and then the shape of the can will be preserved. Please advise how to prevent the cans from bulging on the bottom after the ice freezes. I made these at Christmas & had some of my cans to bulge at the bottom. I hammered back in place, but it was hard getting it even, so the candles wouldn't sit at an angle. Can you suggest what to do to prevent the cans from bulging on the bottom of the can when the ice freezes? Someone mentioned adding sand to the water, but I haven't tried it yet. I don't know if I should fill the can with sand, adding the water or just put the sand in the bottom of the can & then adding the water. I would appreciate any suggestions you may have. Thanks! Lovely and great also for the winter holidays... Caution with metal drill bits, use goggles for eye protection and do it somewhere that the tiny metal shavings will be contained. Years ago had a gust of wind blow a miniscule bit of shaved metal into my eye -- that was NOT a good experience, it was surgically removed and had a bandaged eye for a week. Try seeing and walking with only one eye, not easy and no driving for sure. I was VERY lucky it missed my pupil. Just take precautions... and have fun! how absolutely beautiful and how easy, yet I would never have thought of this! Thank you! Make your own lanterns by following these 7 simple steps! Step 1: Gather used tin cans, remove labels, and clean thoroughly. Step 2: Fill each can with water and freeze overnight until solid. The ice stabilizes the can and prevents it from bending when you punch holes in them later. 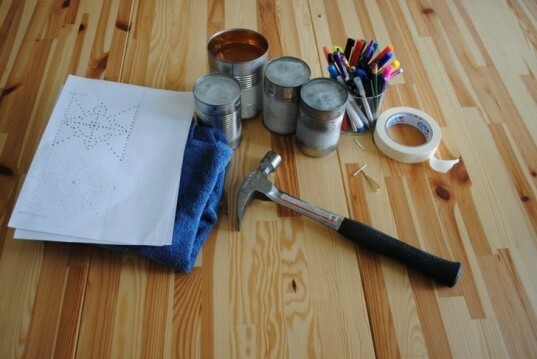 Step 3: Decide on a design for your punched-tin decorations. 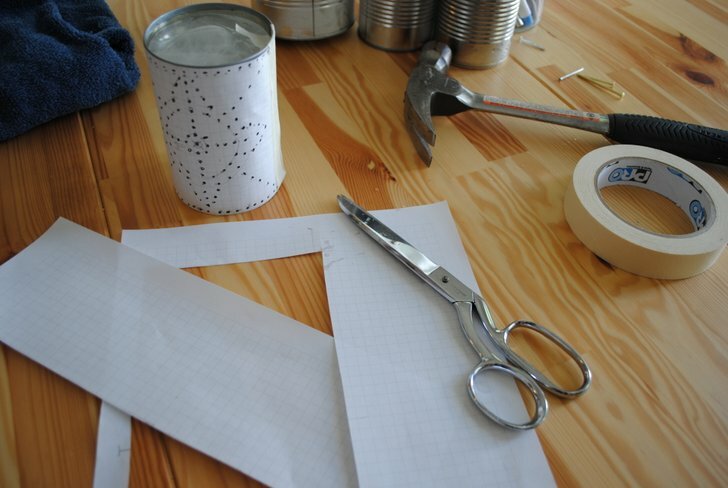 You can draw the pattern out ahead of time on a piece of graph paper and tape it to the can as a guide. Alternatively, you can freehand a design without marking it ahead of time. Knitting patterns, wallpaper, textiles, and folk art are all great inspiration sources for patterns! Step 4: Cradle the frozen tin can in a folded towel (to prevent the can from moving and to catch ice chips). Position a sharp, narrow nail above each mark on your pattern and gently tap it 3-4 times with the hammer until just the point has punched the tin can. Repeat for each mark until you have completed your pattern. 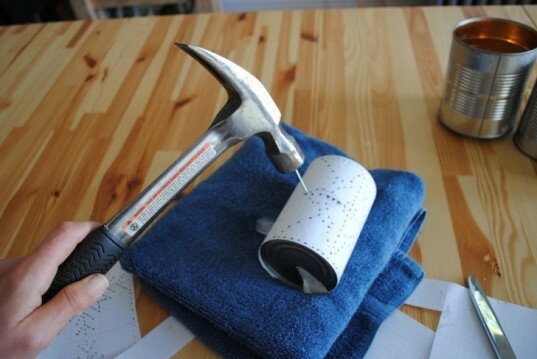 Gently tap the nail to punch a hole in the can - careful not to hit your fingers! Step 5: Rinse the can under a hot tap until the ice block pops out and allow the can to dry. Step 6: If you want to add color to your new punched-tin lantern, you can create a variety of fun, shiny designs by simply using colorful permanent markers. You can color as much or as little as you want - the shiny tin will show through the marker, creating a metallic effect. Step 7: Drop in some lighted votive candles and enjoy the fun, flickering patterns cast by your new handmade lanterns! Be sure to place the lanterns on a fire-safe surface as the candles can get hot. Lighted votives nestled in the bottom of the lanterns. You're all done! Enjoy the light effects from your new recycled lanterns at your next picnic or patio party.